Today I wanted to share my DIY Gym Bag I made with glitter heat transfer material. 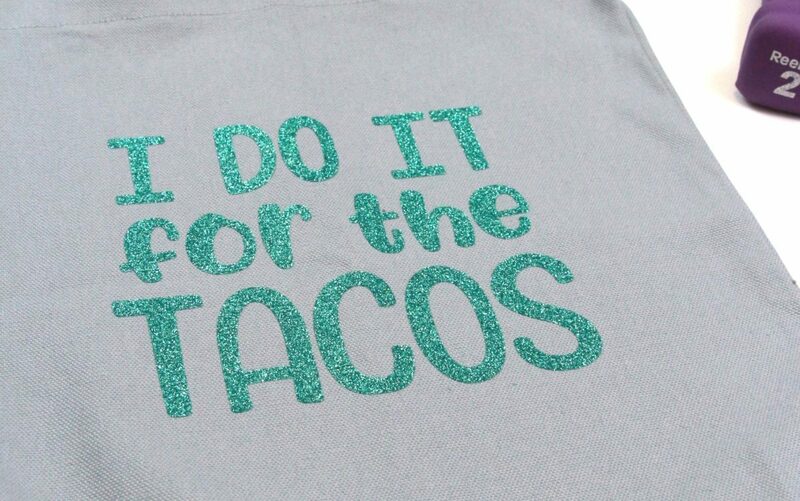 I used a fun design from the Design Store with the phrase “I Do It For The Tacos.” Getting to the gym has been a struggle lately, but this cute bag is encouraging me to get there. It is perfect for holding my yoga mat, towel, water bottle, etc. at the gym and keeping everything organized at home. 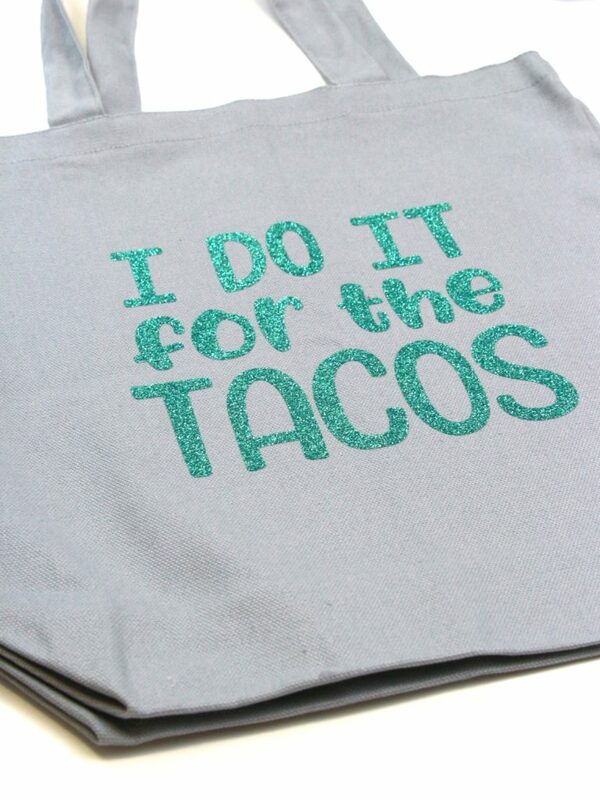 Besides, nothing motivates me more than Taco Tuesday! 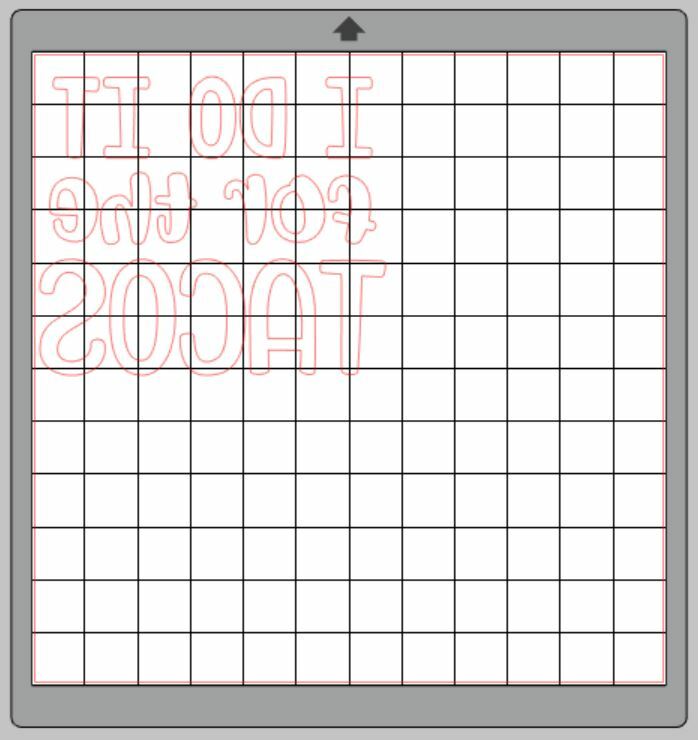 Select the Page Setup panel and adjust your cutting mat size to 12 x 12 (or the size you would like for your tote bag). Download and open your word art (Design ID #196099). 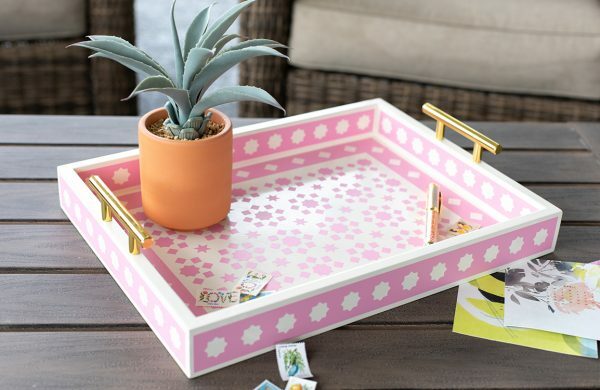 Make your design fill the correct space on your 12 x 12 template. Be sure to move the design as a group so it keeps everything lined up. Select the whole design and click on the Object option in the top toolbar. If you would like to remove the taco drawing like I did, select “ungroup,” and then click on the taco and delete it. Highlight all parts of the design, go the the Object menu, and group the design together again. Go the the Object mirror and then select “Mirror” to flip your design horizontally. Designs must be mirrored when using heat transfer so that your design is correctly oriented when you iron it on. Load your glitter heat transfer on a cutting mat, glitter side down, into your machine. Follow the prompts in Silhouette Studio® to adjust your blade (if using a ratchet blade) for glitter heat transfer and double-check to make sure your design has been selected to cut. Use your fingers or a weeding tool to remove the excess vinyl. 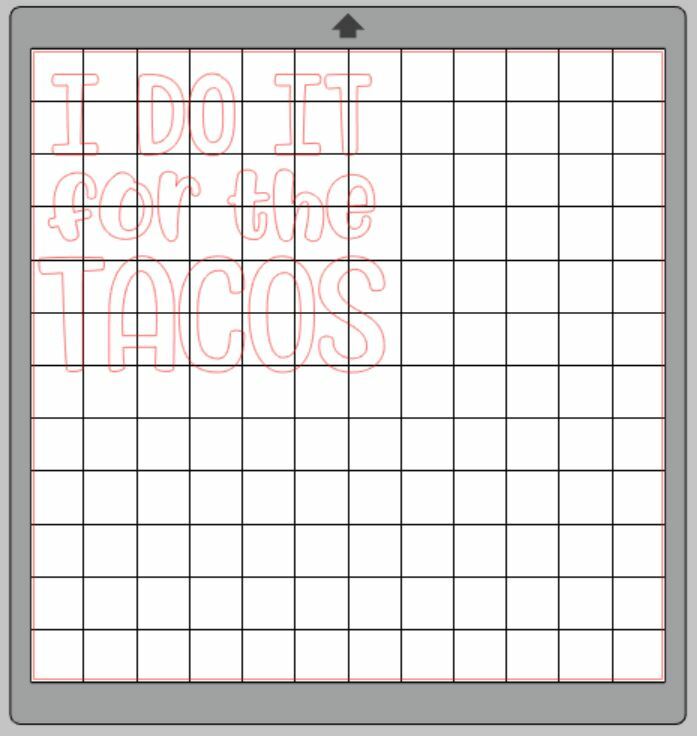 Be sure to leave your design on the clear carrier sheet. This is how you will iron it onto your DIY gym bag. Place your tote bag on your ironing board and make sure it is flat. Place your weeded design face up on top of the tote bag. Spot test your design to see if it sticks to your tote bag when you pull up on the clear carrier sheet. 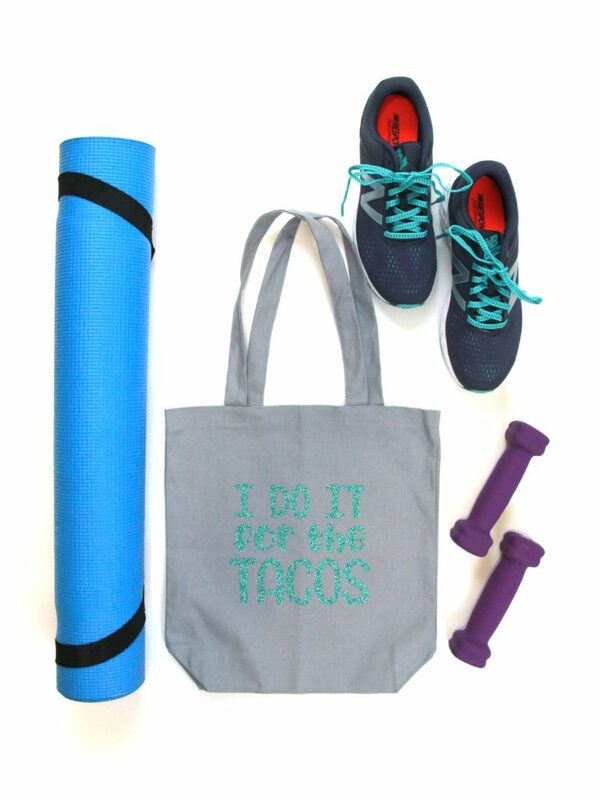 Now you have created a DIY Gym Bag that is pretty, reminds you to work out, AND encourages you to eat more tacos! Tell me what color of heat transfer you will use for your gym bag in the comments below. 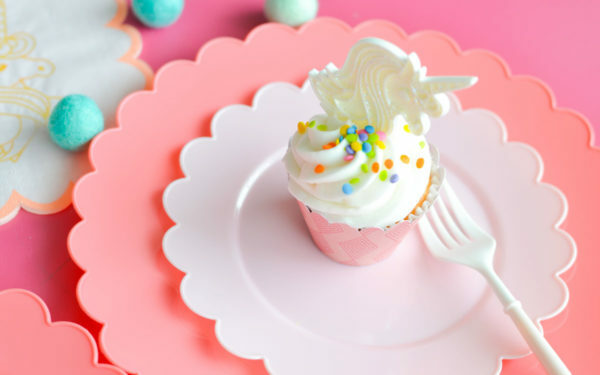 This blog post was originally posted on the Polka Dotted Blue Jay blog, It has been edited and republished with permission from the author. Oh I love this! Especially since we are moving to Mexico. Can’t wait to eat lots of authentic tacos! Love using my Silhouette Cameo and my heat press to make fun personalized bags and t-shirts! Thanks for the idea and steps to make this! Kelly – Eat a couple tacos for me! Be sure to tag me on Instagram if you make a bag for yourself!